It was my first time in Korea. I don’t know how typical Jeju is of Korea, but the country is very advanced with good roads and infrastructure. The race was on the other side of the island from the airport and I was able to see a bit of it by night. When I checked into the hotel I was very hungry and the concierge recommended an Italian restaurant as the only place for vegetarian food. They had a complimentary shuttle and it happened to be dropping off some people at the hotel. I hopped in and met Chrissie, a professional triathlete from England who was returning from dinner. She said the food was OK, but when I got there it was obvious that she wasn’t a vegetarian. I had the option of curried spaghetti or a vegetarian pizza. While I craved the former, I wasn’t brave enough so opted for the pizza. I watched fishing boats from the deck with their lights on while waiting for my meal. It was one of the worst pizza’s I have ever had—and I’ve had a few! This is not auspicious. I stayed at the Hana Hotel which was adjacent to the Lotte resort. There were quite a few other triathletes staying there as it was the least expensive option. I was surprised by the room – it was designed for sitting on the floor and there wasn’t even a chair. Not the most comfortable for westerners, but at least there was room to assemble my bike. At breakfast I met Sandy Burt who had come up from Perth. There were some two dozen Aussies there for the race. They were trying for entries for the Ironman Championships in Kona Hawaii. The way that triathlons work is that there are two groups of competitors: professionals and age group. The age groupers are banded into 5 year intervals and you race against the others your age. Triathlons are also one of the few sports where both professionals and amateurs race together. Sandy told me that he had raced in West Australia and done something like 8:45 and didn’t qualify. There were two entries for Kona in his age group (45-49) and in the overall race his age groupers placed 1,2 and 4th (him). That is an unheard of time not to qualify – and an example of how competitive even older age groupers can be. Sandy hoped to get a slot at this race, and had even gone as far as buying a ticket to Hawaii. He was very fit and with a time like that would surely do well. After registration I browsed the triathlon exposition looking at all the gear. There were a lot of expensive bikes at this race. I purchased a couple of mementos of the race—under the optimistic assumption that I would finish. I then went and assembled my bike which had survived the trip without any problems. I decided to give it a test and rode some 15 miles of the bike course. Although the course description was ‘mainly flat’, it was anything but that. The bike followed the coast of the island with lots of hills. Unfortunately, they were followed by flat sections which meant that you could not get any momentum up for the next one. The heat was a bigger worry – it was very humid and the sun baked you. Fortunately, we had some clouds and a tropical shower. I hoped we would have the same for race day. Finally, there were strong winds. In fact, I almost got blown off my bike in a few places. Those people with solid disc wheels on the rear would find it a challenge to maintain control if the winds come up on race day. On the way back I explored the coast a bit. Jeju is a very beautiful island and the fishing boats in the harbours were very scenic. That evening we had a carbo-feast at the International Convention Centre. There were speeches from several people, Korean rap artists, but the best part was a film of the highlights of last year’s race. They had to cancel the swim due to the effects of a typhoon but did the bike and the run. Glad I wasn’t there. There was one section of a very steep hill where people were grinding their way up. I kind of wished I had brought my road bike with the triple chain ring. You need to have the right bike for the course. The following morning was the pre-race briefing where the rules were explained. It was interesting to say the least. A lot of the discussions focused on the use of wet suits. It seems that many Asians are weak swimmers and are not up to swimming 3.8 km without a wet suit. The problem is that when the water reaches a certain temperature it is dangerous to wear a wet suit as you get overheated and dehydrated. A couple of the pros staying at my hotel had told me they had been out in wet suits and it was too warm to wear them. The organizers said that the temperature was 26 – 28 degrees C which meant that wet suits would not be allowed for professionals, and would only be allowed for age groupers if it dropped (which was unlikely). They then said that if you wanted to wear one you could, but your time would not count towards an age group award. If you can’t do the distance you shouldn’t take a shot at it. There was also another rule which said that you could forgo the swim after one lap, or entirely. You would then wait until 8:30 and be able to start your transition to the bike. The organizer said that this was a ‘lifestyle sport’ and they wanted as many people as possible to finish. One person called this ‘Ironman Lite’. While I had brought my wetsuit with me, I wouldn’t use it in the race—even though this would be my first time competing with a 3.8 km swim. In the afternoon I checked in my bike and gear at the transition area. There are a lot of logistics for a 140.2 mile race. 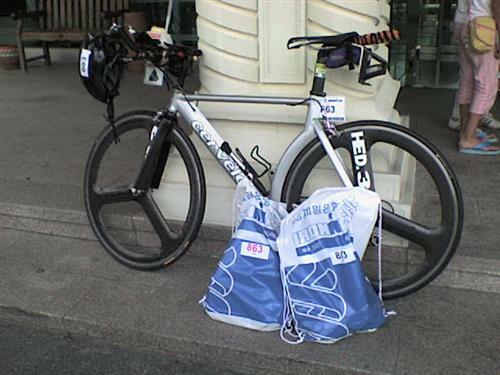 You have your ‘Bike Bag’ which is left in Transition 1 (T1), after the swim. This contains what you will be wearing and carrying on the bike. Then there is the ‘Run Bag’ left in Transition 2 (T2). Optionally, you have ‘Special Needs’ bags for half way through the bike and run. These contain special foods etc. Since I had traveled light to China, I didn’t have anything special so I just had to concentrate on the bike and run bags. You do this by visualizing every aspect of the transition and making sure you have what you need. For example, I made sure that besides the clothes I had things sun tan lotion, endurolyte salt capsules, and, for the run, Advil and an anti-inflammatory. I made sure I took all these pills at the start of the morning before the race as well. The photo below shows my bike – complete with my TriCats triathlon club tiger tail. It got a few comments on the course (the tail – not the bike). I met two Russians at the bike transition area. Vladimir was from Siberia as was Ludmila, although she was from 1000 km away. Vladimir was a serious age grouper who had done quite a few races in different countries. He told me there were only five women Ironman competitors in Russia, although Lubijana now made it six. They prefer Olympic distance triathlons which are only about 32 miles instead of 140.2. We walked down to the beach together and I was dismayed by what I saw. There were large waves coming in and it looked like a very challenging place to swim. It would be hard to get through the surf. They had laid the buoys out and it looked like quite a distance to swim—and we had to do it twice. Each lap was 1.9 km and we would then exit, run across the timing mat to make sure we did two laps, and get in again. Vladimir and Ludmila went back up and I wandered along the beach. The water was like a bath tub and so it would be crazy to wear a wet suit. On the beach I met Kara and Dan, two Americans from San Diego. She had the goal of doing an Ironman on every continent and this was the last one for her. They were staying at the Hyatt and we walked along the beach chatting, especially about New Zealand which is a place that interested them. I complained about getting vegetarian food and Dan said that the Hyatt was pretty good. They took me to the restaurant and there were quite a few options. After returning to the hotel and changing, I wandered back to grab dinner. Arriving wet due to a tropical downpour, I had a delightful Spaghetti meal, as suggested by Cara. Pity I didn’t find this place when I first arrived. Dan and Cara arrived later and we had a nice time together. The triathlete community tends to be a very friendly group, much more so than the cyclists I ride with. From there it was back to the hotel for an early night. I was somewhat daunted by the following day and couldn’t sleep so in the end took a sleeping pill. You are amazing and have truly earned your Ironman title! I’m sure Lis will see that in you as well … ‘sooner than later’ of course! Kudos!! Excellent Chris. Way to be bold.